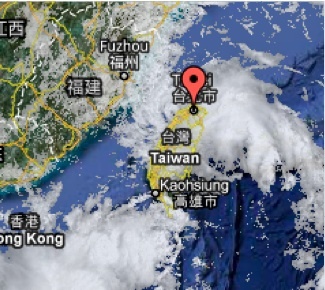 Now, onto the weather: this past Monday and Tuesday, we were hit with two “Tropical Depressions” that created a good deal of wind, rain, and general mayhem among the already chaotic Taipei street traffic. Monday morning, I had my Chinese placement test and Orientation at National Chengchi University (Zheng Zhi Da Xue, 政治大學), and then lingered after lunch with a fellow classmate for much of the afternoon due to torrential downpours. Nothing like lousy weather for making friends! After parting ways, I went to Starbucks to write, when all of a sudden I felt a vibration from the wall to my left. I thought at first that maybe my cell phone’s ringer had gone into overdrive, when I realized that something far more powerful was shaking the wall. Two women talking at a table looked up when the hanging track lights above us started to shake, and laughed. Laughed!! Which made me relax and just enjoy the sensation of being jarred out of my comfort zone. It was a small tremor, to say the least (I don’t even know that my table or chair shook much, just the walls and the lights), but it was my first. 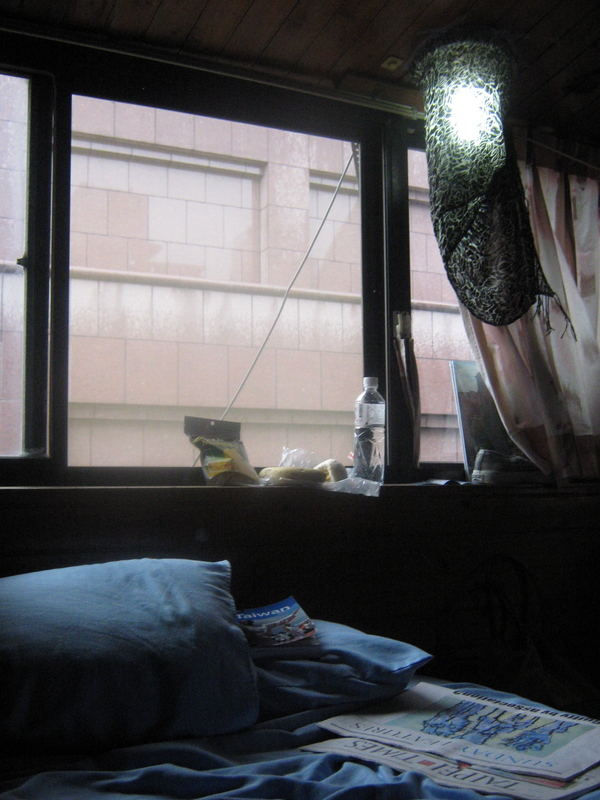 My hostel room on a stormy day kind of reminds me of a cabin in a pirate ship. Please note the lunch of leftovers and scarf-as-lampshade. 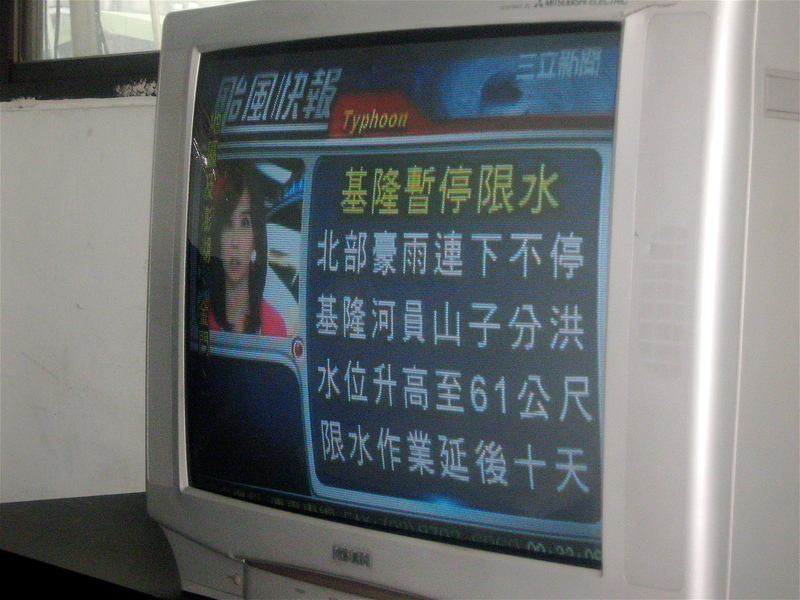 We had a good laugh, and I thought to myself, Now I too can join the Taiwanese Earthquake and Typhoon club! I celebrated my residential rite of passage (and desire to not get soaked) by staying in, cleaning my hostel room, and taking a lovely afternoon nap. What is the Starbucks menu there like? I always enjoyed the menu at the McDonalds in India…the Maharaja burger being my favorite. So far I’ve only had coffee, and a Soy Green Tea Latte that was probably the best one I’ve ever had. Across the board in Taiwan, soy milk (豆漿) is amazing here! I have a pet theory that in the U.S., they try to make soy milk taste like regular (cow) milk. Which then makes it taste disgusting to me, since when I’m drinking soy milk, I expect it to taste like soy milk!